Samantha Rayn Bachman is certainly a woman of many talents, skills and qualification. 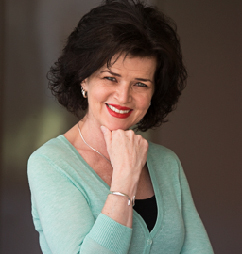 She has a Ph.D. in Metaphysics, has had over 30 years experience in the medical and healthcare industry and is qualified in many areas of Orthodox, Orthopathic, Naturopathic & Bio-Energetic Medicine. She is a well renowned global speaker, radio personality, published author, TV host, lifestyle coach, and entrepreneur as well a being a very suave comedienne. She now teaches how to re-connect to the field of consciousness, where all Life, Healing and Wisdom originates. Her years at the Pacific Private Hospital with a brilliant neurologist and neurosurgeon, Dr., Melinda Pascoe, have given her a great understanding of the dis-eases and imbalances of the human nervous system. This along with decades of consuming herself in the research and teachings of some brilliant doctors and scientists have helped develop her understanding of what it is to be a LIVING BEING; “Most just don’t know how to use their mind and have little or no understanding of consciousness and the powers we all have to create balance and harmony [or disharmony] in our body and life as a whole”, says Samantha. She understands well how not only food, but, our ‘thinking’ and our emotions affect us as a whole, including our subtle body. Samantha covers the topics of Heart, Mind, Emotions and Consciousness with not only a comprehensive description of what our body and mind is, but also what they are capable of. She gives you a very humorous ride through what it is to be human and have an Ego, that often leads us in every direct but the right one. For nearly three decades Samantha has focused her attention on researching the human nervous system, cell re-programming via epigenetics, quantum, bio-energetics and electromagnetic fields, frequency & vibration, coherent water and the heart to gain understanding of how we connect and interact with the field around us—all of which reflect her passion for exploring mind, consciousness and emotions to teach people how they can not only heal illness, but also to change anything in their life and live what they desire to be in their life without self-sabotaging themselves. She has also explored the science and mechanics behind spontaneous remissions and how people heal themselves of chronic conditions and even terminal diseases by using prayer, belief, ‘though’ and meditation; to develop an even better understand of how our focused mind can create miracles in our life. Her funny and easy-to-understand style, helps people understand how they can re-wire their brains and re-condition their bodies and silence their ego to make lasting changes. Meditation is brilliant at taking our attention away from what is happening around us so as we are able to focus and concentrate our focus, on what it is we wish to become. Change requires coherence and alignment of your thoughts, emotions and feelings with that which you wish to create in your life, says Samantha. She has interviewed and filmed (via her TV show- A Bloody Brilliant Life), extensively on people who have had near-death experiences or been the recipients of donated organs. Her understanding of ‘the other side’ of life has her audiences thoroughly engaged as she helps them understand how ‘they too’ can re-connect and find life’s purpose and answers. Samantha speaks to a room full of School P & C folks. In her unique style Samantha has a mix of humour and in your face facts on the state of our health care system and the problems we face if we don’t take responsibility for what we eat and our over all lifestyle. We have disease rates rising and the only way out is to stop treating our body like a ‘Minny Skip’ says Samantha. She loves nothing more than to teach people how to eat well and get away from the disease management model we have become familiar, with and take control of our own health via proper diet and lifestyle habits. We are digging our graves with our teeth, it is time to understand what our body really needs and reclaim our health says Samantha. Samantha is in the kitchen at J.C’s Quality Foods with Joe Cannatelli (The Boss) showing just what can be done with a few natural ingredients and a blender. She shares with you the benefits of eating well and why we have so many nut allergies these days.